BlueHour made the annual visit to one of our favorite locations to shoot: The Canadian Rockies. 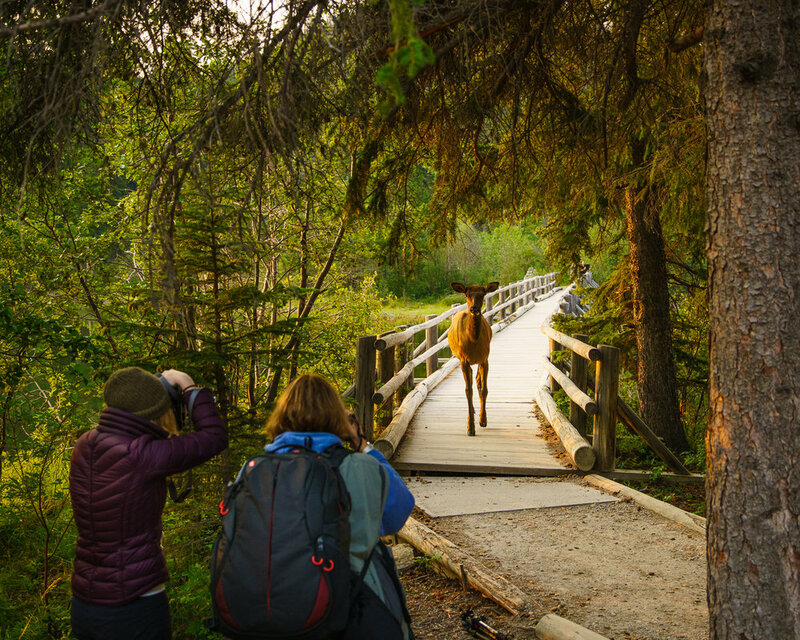 We’ve been running photo tours through Jasper & Banff National Parks since our successful Kickstarter Campaign to run this tour back in 2015. It’s always a treat for us to return to the same locations year after year, and to see how they’ve changed or stayed the same. This is a shot of Paul looking out on Emerald Lake, one of the glacial lakes known for it’s deep emerald color. It’s good to challenge yourself, too, and to experiment with new compositions that you may not have thought of years before. Cave & Basin - the birthplace of the Canadian National Parks system. We also make sure to visit new spots. We’re always improving the experience and keeping our tours interesting! We even decided to recreate a portrait photo we made last time, atop Peyto Lake. This time, at sunrise. I like this one much better! Random road stops can also be rewarding. We found lots of pink flowers blooming over a burned area in front of a mountain. One of our better light displays during our 8 days was at Lake Minnewanka. In years past, this area has never been that interesting, or the weather was rainy and drizzly. This year, it took on a different look and became a prime photo-spot. Paul even made a timelapse video to show how the light changed over the course of sunset. Continuing with this theme of change, Spirit Island is another area that in years past, has always been rainy and unpleasant despite being on our the most anticipated parts of the trip. This time, the weather was pleasant, but conditions still weren’t ideal due to the wildfires nearby. The second half of our trip was plagued by hazy skies. But, in photography, you have to make due with the conditions you have. We were able to make use of the haze for some unique pattern compositions. The haze is so thick that the sun seems like it is always setting, and is just burning a hole in the sky. On our last day, we were rewarded with a calm lake, and mirror-like reflection we had been hoping for at Pyramid Lake. This was a blessing after days of mountainless and hazy skies. Sure enough, only an hour after our photo taking, the haze came back. We’re always happy to have moments like this. Probably the favorite moment of the week was seeing a Grizzly bear mom with her two cubs. We never expect to see grizzlies when we visit, but we have each time. It’s always a breathtaking moment, especially if you have never seen a bear before. They truly are one of the best parts of the Canadian wilderness. And the golden light was perfect too. We love Canada - it has something for everyone to enjoy. Its the perfect mix of sweeping landscapes, glacial lakes, adventure and wildlife. On this trip, we saw grizzly bears, black bears, lots of elk, pikas and mountain goats. It’s one of our favorite trips to run for that reason - it is different every time. We hope to see you next year! Join us in August, 2019.